Why I Love ETFs (And You Should Too)! If you’re not familiar with Exchange Traded Funds (ETFs), let me fill you in on the ETF basics, and why you should be investing in them. I’ll reveal my bias right off the bat and tell you they are the only investment product I buy anymore. I love ETFs! I used to try to pick stocks and time the market, and sometimes it worked. In the long run however, my returns would always fall below market averages. I think the following will help convince you as well. This is a little complicated, but bear with me. Similar to an index mutual fund, ETFs are designed to provide diversification at a low-cost, but there are some key differences we’ll get into later. An Exchange Traded Fund is an investment product that trades on a stock market and tracks a particular stock market index like the S&P 500, NASDAQ 100, or the Dow. There are also ETFs that track other things like commodities, foreign markets, styles (small cap, large cap), and bonds to name a few. Shares of an ETF are simply shares in a portfolio that tracks that index, and that portfolio tries to mimic the returns/yields of that index as closely as possible. ETFs have been around since the 80’s, but the first ETF to gain widespread support was the S&P 500 Depository Receipt ETF. It came into being in the early 90’s and you may know it by its more common nickname of the SPDR (spider). To this day, it’s one of the most popular ETFs out there. 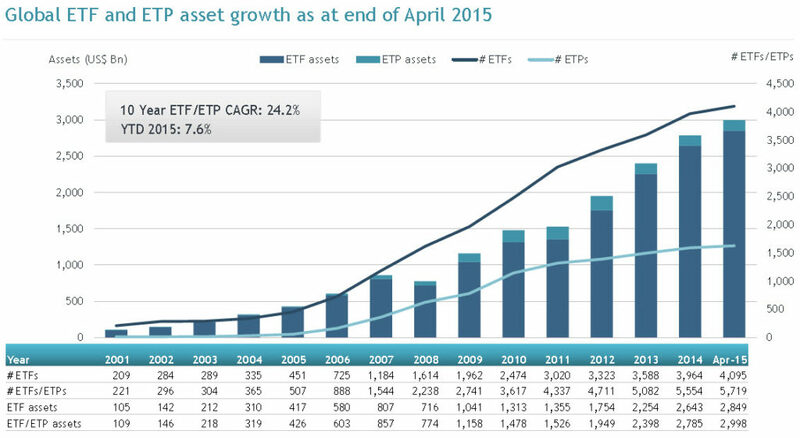 The overall growth in the number of ETFs on the market and their value is actually pretty staggering. 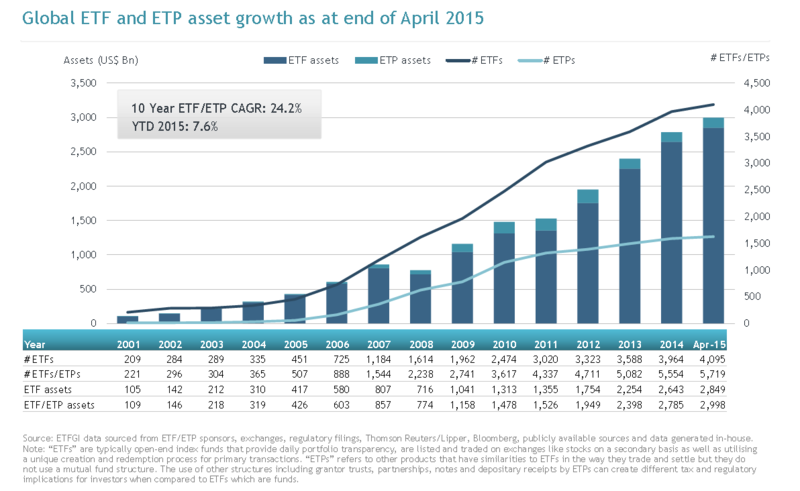 From 2001 to 2015, the number of global ETFs has gone from 209 to over 4000! Low Cost – You can have an investment that makes a great return, but if you lose those gains because of high fees then it defeats the whole purpose. The low fees associated with ETFs compared to mutual funds should be reason enough to give them serious consideration. There are two types of fees associated with ETFs. First are commission fees which you pay when you go to buy an ETF. This next part is critical. If you are going to be buying them frequently, be sure to look into commission free ETFs. There are more and more being offered by multiple investment firms like Vanguard or Charles Schwab. You don’t want to contribute $100 per month and pay a $10 commission each time. The second fee you will pay is the management expense ratio or MER. These are much lower than mutual funds and are not paid directly by you, but instead are deducted directly from the funds returns. A full list of fee information is available from the ETF provider on their website. I will not begin to try to explain the tax benefits of ETFs over mutual funds, but I highly recommend watching the following. Save it for later if you’re drowsy, but it’s important to understand. Flexibility – ETFs can be bought and sold on the stock market like any other stock, and it’s price changes throughout the day. This differs from a mutual fund which is generally bought through a mutual fund firm, and whose value or NAV is determined at the end of the trading day. This allows you to get in and out of the ETF multiple times per day in addition to being able to short it. I have never tried this myself. You can also have the option to shift your investment strategy throughout the day. Maybe you like US index ETFs in the morning, but decide to sell and move your money into international ETFs in the afternoon! Again, not something I do, and should probably be reserved for the pros. Diversification – It goes without saying that having your investments spread over multiple areas helps guard your savings if one area has a meltdown. You wouldn’t have wanted to be 100% invested in tech stocks when the tech bubble burst in 2001 right? There are now ETFs for almost every market index and sector you can think of. US, International, BRIC, small cap, large cap, growth, value, etc…. There are also industry based ETFs including real estate, biotech, financial, oil and gas, etc…. Finally, there are ETFs that cover other asset classes like fixed income (bonds). How diversified you want to be is virtually limitless, not that I recommend going this route. I find it sufficient to allocate equal percentages of my investments between US stock ETFs, International stock ETFs and bond ETFs. If you want a great tool to determine your own allocation strategy, try the free Vanguard ETF Recommendation Tool. BlackRock (iShares) also have one here. These tools can sometimes go overboard on the number of ETFs they recommend for your portfolio. I have had a lot of success in holding a mix of three ETFs. A US Equity ETF, an International Equity ETF and a Bond ETF. That’s it. I keep the bond ETF allocation percentage close to my age and split the rest between the other two. That way, the older I get the more I’m invested in the safer bond ETF. Simplicity – Buying ETFs is typically what’s called passive investing. You don’t have to track the performance of dozens stocks in a portfolio. You also don’t have to try to keep tabs on when you should buy or sell them. Just buy a few ETFs, contribute more money over time and forget about them. Thanks to the miracle of compound interest, your investment will grow with minimal effort on your part. Investing in ETFs is not complicated. Once you have your recommendations from the tools above, you can invest with any number of discount brokerages out there. Wikipedia actually keep a great list with all the information on minimum investment requirements, commissions, and fees. For reference, the top brokerages in the US by customers and assets are Scottrade, Charles Schwab, Fidelity Investments, E-Trade and TD Ameritrade. Remember what I said about keeping commissions at an absolute minimum. If you don’t, and you’re making regular contributions, you’re probably better off with an index based mutual fund. There are definitely some disadvantages to ETFs which I’ll write about in another post. For me they’ve provided simplicity and diversification to my portfolio. Combine this with low costs and a 7 year return of around 10%, and I think you’ll understand why I love ETFs. I hope I’ve provided some incentive to at least have a look at them for yourself. As always I welcome any comments you might have. I would love to hear your thoughts on portfolio mixes and strategies.